For those focused on a medical weight loss program to assist in strength building, fitness, weight loss and healthy dietary choices. BodEn Fitness System LLC is a revolutionary, integrated weight loss and fitness system. By focusing on the individual and planning for their specific weight loss needs, we are able to incorporate the latest in medical weight loss treatments, with healthy strength and cardiovascular training, as well as healthy and great-tasting meal plans. This has made us the East Coast's choice for online personal trainers and fitness coaches. Learn more and see why we are a Top Rated Local® wellness program. Our primary goal is to provide a medical weight loss program for people who want to lose weight naturally. We use the most recent medical research to tell us how our clients can lose weight healthily and keep it off*. Have you been told by your doctor that losing weight will prevent you from having diabetes, high blood pressure, heart attack, lower back pain, knee pain, or other health problems? We can help you! We provide an integrated approach to weight loss, working with a medical team, a BodEn Certified fitness team, as well as a dietary team to help you increase physical activity, improve cardiovascular health, increase muscle mass, and experience long lasting weight loss*. Our system has proven to be effective within the military and now we are taking these proven, reproducible results to the civilian community*. Don’t trust weight loss systems that offer instant results through crash dieting; even when you do lose weight with them, you will inevitably gain it back. With a team of medical professionals to guide you, our program is the healthiest and safest way to approach weight loss*. We can get you the permanent results you are after*. Our goal is to emphasize health and wellness. We understand how busy your schedule is. We also understand that exercise and good nutrition is the answer to a large variety of health problems, such as obesity, diabetes, high blood pressure, and heart disease. 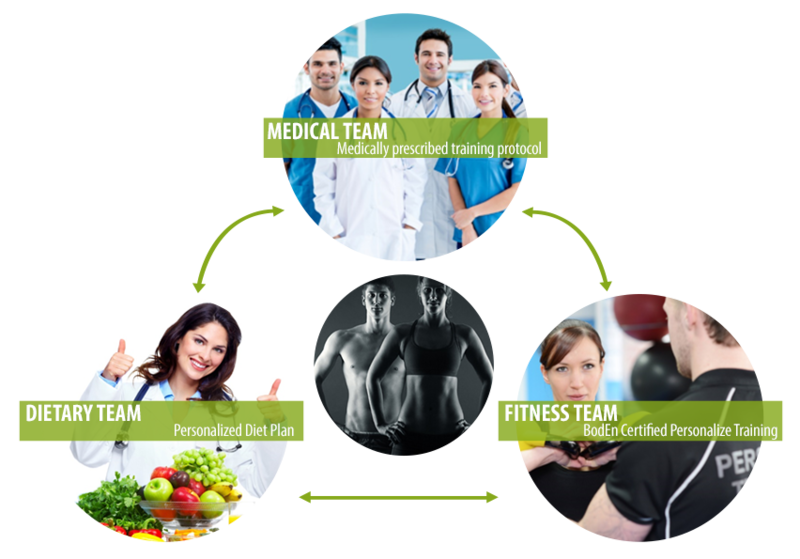 We have an integrated team approach to weight loss and fitness that includes a healthcare provider, a nutritionist, a BodEn certified personal trainer, and a program to fit your schedule. We also provide free gym access and a fitness app to track your diet, exercise, and weight progress. Whatever your needs are, we can offer you a fitness package that fits your budget. Are you ready to take your health into your own hands?